Both my husband and I are overweight, inspite of eating what I think is a really good vegetarian* diet(*mostly vegan, but we do occasionally give in to cheesy or eggy dishes and even the occasional surprise chicken in a wrap that we thought was veggie). We grow a lot of berries and eat our own veggies all summer, so by and large we are 'organic' in our own home-- but not so much when we leave the house and join in at potlucks or eat in restaurants. At home we also try to be 'low fat' and admittedly our digestion is better when we eat less greasy stuff. So, we are fat vegans, let's say (apologies to the "real" vegans out there). We are convicted of healthful benefits of the low fat vegan lifestyle, and have certainly explored any number of other ways of eating for health (including the ovo-lacto and pescatarian vegetarian styles, paleo, 80-10-10 raw vegan, etc. etc.). So, what is the problem? Why aren't we trim and slim and walking advertisements for the low fat vegan choice?? I think it is partly because we are both people who like to explore the borders of what others consider 'healthy'. We are curious about the extremes (like 100% raw vegan or water fasting for 16 days) and look at the plunge into those relatively uncharted waters as an adventure in our sunset years. So we plunge, but we are so interested in such a broad range of ways to live life, and so pampered by the Internet to think that way, that we metaphorically skip around like a porpoise in the waves of possibility and get distracted from our original intention. I would say that yummy chocolate-y treats and high-calorie desserts are our biggest downfall. We know how great we feel when we eat like the guys in the film, "Forks Over Knives" but we also get distracted by the dessert table at our weekly church potluck or by the samplings at Costco, again etc. etc. etc. There are lots of other reasons for our being overweight. And lots of health concerns and embarrassment about our appearance should provide motivation for immediate measures to take the unhealthy pounds off. It is obvious to us that we need some additional motivation. So, on our recent road trip to see our granddaughters and their parents we listened to an audio CD of the book, Nudge: Improving Decisions About Health, Wealth, and Happiness . The authors, Richard H. Thaler and Cass R. Sunstein, give fascinating examples of how people can be influenced (or nudged) into making healthier decisions. We 'borrowed' the one about having to pay out to the Nazi Party if we fail to keep our eyes on the prize. We did try to think of something more repugnant to us, but couldn't. The other one that sticks in my mind is 'doctors with addictions' who actively 'use' various harmful drugs and seem unable to 'stay clean' without discreet professional help. A psychologist who works with such clients has them write a letter to their licencing agency confessing their 'lapse' back into using these drugs, a letter which will be sent IF they return to using the drugs. This, of course, most assuredly means that they would lose their professional licences and probably they would also face legal prosecution. That is just the sort of scare-tactic motivation some of us need to do what we know is right! I have my charts all made up for weekly weigh-ins and am quite excited about the possibility of weighing less than I have in years, by March 1st. 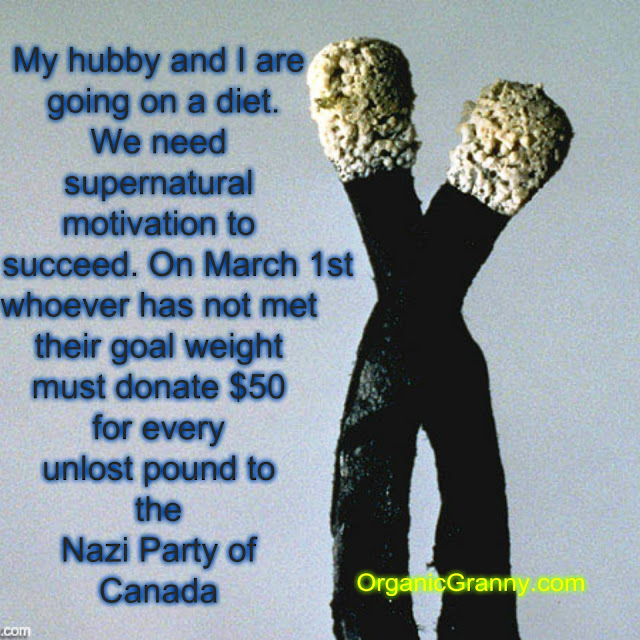 Ed is hyped too (it was his idea to pay out to the Nazi Party of Canada) but is mystified that, overnight, he seemingly GAINED two pounds. Hahaha. I plan to stick to the low fat vegan way of eating and lifestyle (go to bed earlier, don't eat between meals, get in some exercise, etc.). This weekend is a real test for my being strong enough not to rationalize a fall-back into comfort foods: there are projections of a dramatic couple of rain and wind-storms fueled by Typhoon Songda and it hasn't stopped raining for several hours. The other point of anxiety is that Ed has headed over to the Mainland to a Men's Retreat until Sunday evening and I have not been alone in my house without our little dog Zoe in over ten years. She left us in late April this year. Will I stay true to our goals? I plan to post about the journey on here pretty regularly, so if you want to follow along, that would be greatly encouraging... particularly if you post the odd hurrah in the Comments below. You are also welcome to follow me on Twitter and Instagram. Thanks for reading!